Could implants possibly be cancerous ? No instances has been reported in the dental or medical literature of dental implants causing cancer. Are Implants Inserted for aesthetic or cosmetic reasons ? Not usually. The primary objective of the dental implants is to give additional support to replacement teeth. Cosmetic enhancement is possible with the replacement teeth, However, and expectation should be fully discussed before treatment. Are the Implants guaranteed ? No surgical procedure done in the mouth can be fully guaranteed. There are so many factors contributed by the patient as well as the dental surgeon that makes it impossible to guarantee 100 percent success. 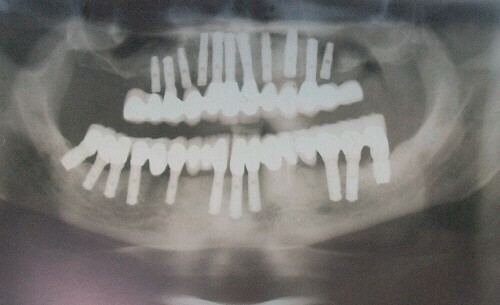 The dental surgeon will try their best to place the implant properly, provide the patient with the information required to perform appropriate home care (exp: brushing , flossing) and be able to come for regular follow up appointments to evaluate the progress of the implants and overall dental health. 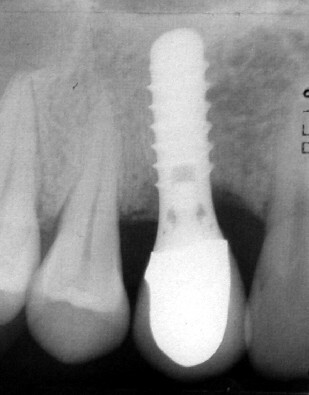 If not difficulties may arise causing failure of the implant. Ultimately, without full co operation of the patient it is no use starting the treatment in the first place. Because of the complexity of implant dentistry , it is important that all postoperative examinations or treatments be handled by the same dental surgeon or surgical team. Referrals to other dental surgeons will be made only to appropriate practitioners with experience and training in implant dentistry. Just as with any surgery, there can be some discomfort. However, anesthetics virtually eliminate discomfort during the actual surgery. Post operative discomfort is similar to that experienced after tooth removal or extraction. Patients are provided with medication to alleviate this discomfort. How much time does the treatment take ? It depends on the patient’s condition and needs and the the extent of the work involved. Individual operations may take from half and hour to several hours. There may be as little as one operations or a series of operations and follow-up visits scheduled over a period of months to ensure proper healing and processing of the tooth restoration . How long will I be off work ? Most often, the patient can return to work normally as one would after a routine treatment or visit. You do not have to stay overnight at the dental surgery office. However, some other patients prefer taking the of surgery off from work and possibly another day or two for recovery. Some swelling , discomfort and possibly some bruising can be expected and you should not panic if you see them. The dental surgeon would usually advice patients to go on a soft diet for one or two days, do not take any hot or cold drinks and also do not use a straw to drink or eat as it will create negative pressure. Leading to unnecessary opening of surgical sutures. Is it expensive , What is the cost of an implant ? Implant cost procedures, which vary in complexity and extent depending on the patients dental condition and requirements , can ultimately involve a significant investment. Most patients after completion of treatment feel that it was worth the investment and they would gladly do it again. While a basic dental implant price in the US is typically US 1,500 to US 4,000, depending on your individual case. Additional costs for things such as in the case lack of remaining bone support or complete lack of teeth in lower jaw , the initial estimate of the cost of the implants can quickly hike up to as much as US 10,000 to US 40,000 for the complete procedure for the upper or lower jaw. Interestingly, most people assume that dental implant treatment is more expensive than alternative methods of tooth replacement. In actual fact Dental implants are more cost effective than any other prosthesis in the mouth , be it a removable or a fixed prosthesis. The basic reason for this cost differential is due to the fact that other treatments like removable dentures and bridge work require extensive repairs, replacements, and might not last as long compared to dental implants. Will insurance pay for the Implant? Some dental procedures , implant surgeries and portions of implant surgeries are covered by dental and medical insurance policies. However, it is still a complex and tricky procedure. Despite the difficulties just mentioned, substantial coverage for dentistry does exist. To take advantage of it, office staff should examine and understand each patient’s dental insurance, applicable procedures and code numbers. In addition, procedure codes that apply to implant dentistry can be found in the patient’s medical procedure codes and understanding of how the filing of medical claims differ in content and style from that of normal dental claim forms. Effort is usually extended to help patients realize the benefits to which they are entitled. Bibliography: Principles and Practice of Implant Dentistry ; Charles M. Weiss & Adam Weiss. This entry was posted in Oral Care and tagged dental implant price, dental implant treatment, dental implants, fixed prosthesis, implant, implant cost, implant dentistry, implant surgeries, implants on March 21, 2010 by samanthaloh.